The comments Katy Bowman made in the latest Katy Says podcast, ‘Furniture Freak Goes Mainstream‘ about feeling like a member of a different species when confronted by the crew from Prevention magazine (a well-known, well-regarded, canonical health magazine in the US) resonated so very deeply with me (ten years of feeling like I was this dreamy, fantasising, fidgety freak hiding in plain sight within a mainstream, serious and traditionally smart corporate culture – the only concession being that it was a Canadian organisation); but when an innovative thinker, teacher, writer, and leader gets a touch of the mainstream, perhaps this is something of an inevitable experience. So this is it: one of the most widely-distributed health magazines in the US has featured Katy Bowman’s groundbreaking, habit-shattering, culture-challenging work on health, our bodies, and our (Western) sedentary cultures; a 12-page centerfold spread no less. Establishment meets counter-culture. Smart suit walks with barefoot tree climber. We know, as is acknowledged in the podcast, that it often takes this kind of endorsement for new ideas to be accepted; mainstream publications manufacture consensus and acceptance around ideas that, if they challenge the status quo, would otherwise remain largely invisible. We know […] that it often takes this kind of endorsement for new ideas to be accepted; mainstream publications manufacture consensus and acceptance around ideas that, if they challenge the status quo, would otherwise remain largely invisible. I don’t know the magazine nor its prestige, haven’t seen the piece, but I have great faith that Katy Bowman has ensured the integrity of her message is retained (as is attested by movement geek Dani Hemmat, producer of Katy Says and certified Restorative Exercise Specialist). This alone is no mean feat in a publishing world under pressure to over-simplify and sell palatable content (and in all editions previous to Katy’s feature, include content that would sit easily with the now-absent pharmaceutical adverts funding the publication). The feature told Katy Bowman’s story, the piece is ‘about her’; I’d like to see it just to take a look at how this has been done. It is a common format for a magazine to adopt, well-known to sell copy – we like to read about each other, we like to read about people – but a piece which paints a portrait of an individual also inevitably objectifies, distances itself from the content. Be that as it may, if each reader of the one-third who will neither hate the piece nor feel entirely indifferent to it has a light-bulb moment because of it (and the two other exposures necessary for it to register an impact) the format is as irrelevant as the mud between my toes. As part of the interview, Katy Bowman described heading outside to continue the photo shoot for the piece, going barefoot while the stylists looked on (seemingly) aghast / impressed as she was encouraged to walk across a fairly high-up tree-trunk (“I could never do that,” reportedly said one of the stylists) and remarked at how it felt like they had come to photograph an animal in its natural setting. I had visions of Jennifer Lawrence playing the nimble, bull’s-eye striking, dirt-stained Mockingjay in The Hunger Games surrounded by preened, gasping, applauding, decorated stylists from the Capitol. She stands out and doesn’t always like that. But we need that. We need someone to stand out. (And how interesting that is isn’t shocking that should be simply for being able to walk barefoot outside and walk across a tree trunk while no one else who was there believed they could do that) Katy Bowman’s work stands out, loud and clear, as does all of the content produced by the Nutritious Movement Institute. I mean ALL of it. Independent publishing houses such Propriometrics Press are essential. They incubate, protect, and give voice to authors such as Katy Bowman whose ideas may be some of the most important agents of change some of us are lucky enough to find in our lives. I am very lucky to have a super-wise and well-informed mum who, after an early career as a competitive swimmer, taught exercise for a living – and then experienced physical changes over time which lead her to the life-changing work of Katy Bowman. As part of the crucial conversation on health, well-being, and culture which we all must have if we want to thrive as human beings (of one species or another) publishing houses such as Propriometrics Press and Publishers such as Katy Bowman have a critical role to play. They invite us to get up from our chairs, kick off our unsteady heels, uncurl our hunched spines from our devices, and bust our breath through our culturally corseted bodies (and brains). 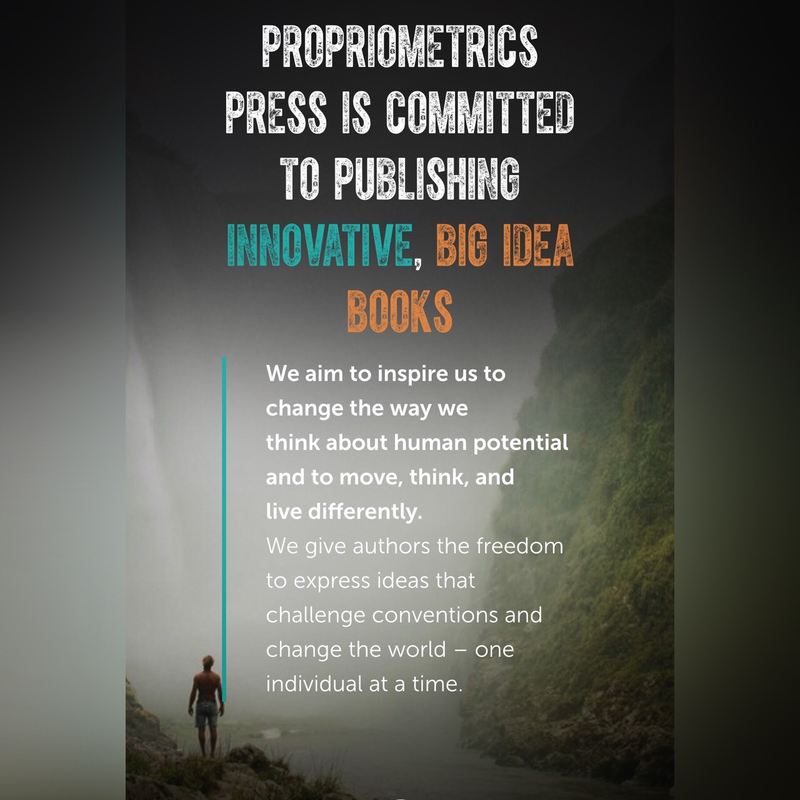 Thank you Propriometrics Press, we need you. Stay nimble and independent and occasionally feed the big fish but then swim away. Titles on their list include Katy Bowman’s Move Your DNA, Whole Body Barefoot, Diastasis Recti, and the forthcoming Movement Matters. Pre-sale for Eat Well, Move Well, Live Well by Galiana and Roland Denzel is now open here.